Last week, I stumbled across these fresh cranberry beans at the Santa Monica Farmers’ Market. These beans really captured my attention. Just look at them! They’re fresh and this means that they take less time to cook than packaged dry beans. 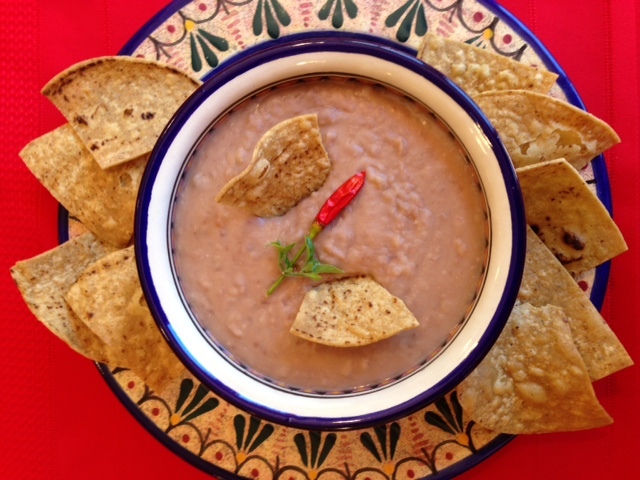 In honor of Cinco de Mayo, we’re makin’ some frijoles refritos or refried beans. 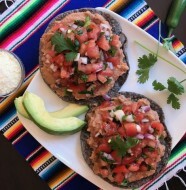 You can add these creamy beans to tostadas and tacos or serve them as a dip with tortilla chips. I’m sure you won’t forget the Tequila shots and/or the Margaritas… y andale! Or, just go for it! 1. 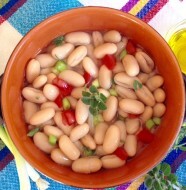 Place beans in a 4-quart glass or porcelain bowl; add enough cold water to cover the beans. 2. Cover the bowl and let beans soak overnight. 3. After the beans have soaked overnight, drain them completely. 4. Transfer the beans to a 6-quart sauce pot; add the peeled and halved onion and the bay leaves. 5. 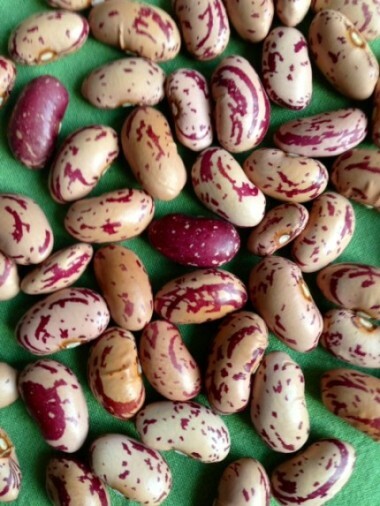 Cover the beans with about 2-1/2 to 3 quarts cold water (there should be 3 extra inches of cold over surface of beans). 6. Bring the beans to a boil. 7. After beans come to a boil, set heat on low. Simmer the beans for about 45 minutes or until they are tender, but not broken. 8. Set the sauce pot with beans aside to cool. 9. After the beans have cooled to room temperature, drain them, reserving about 1 cup of the cooking liquid. 10. Discard onion and bay leaves. 11. Transfer the drained beans to a food processor; process beans into a puree. 1. In an 8-quart sauce pot, heat the oil. 2. When oil is not, add the bacon strips, finely chopped onion and the minced Serrano chile. 3. On medium-high heat, stir-fry the mixture until onion is translucent and bacon turns crisp, about 2 to 3 minutes. 4. After 2 to 3 minutes, remove the bacon strips and discard them. 5. Using a wooden spoon, carefully stir the pureed beans into the stir-fried mixture. 6. Constantly and quickly stir the beans, bringing them to a boil – stand away from stove to avoid hot splatters. 7. Immediately lower the heat setting. If the boil is too strong, cover the sauce pot to avoid hot splatters once more. 8. Constantly stir the beans for about 2 to 3 minutes. 9. After 2 to 3 minutes, add the Half n’ Half cream and the mashed Chipotle chile; continue stirring until the refried bean mixture is uniform. 10. Stir in about 1 teaspoon salt. Taste and adjust seasonings. *NOTE: Chipotle chiles in adobo sauce are sold in cans. 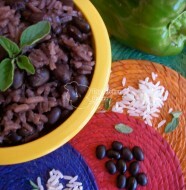 They can be found in the international foods section of standard supermarkets or in Latin American grocery stores.